Crêpes with a generous spread of Nutella has long been one of my favourite treats, so these pancakes have been inspired by that amazing combination! 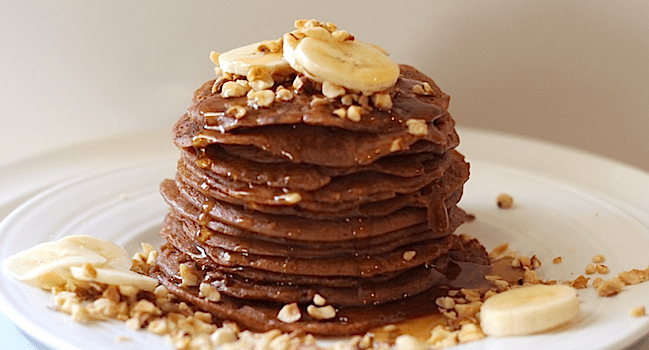 I have added raw cacao powder and chopped hazelnuts to this pancake mixture and the results are absolutely delicious! If you can’t get your hands on cacao powder, regular cocoa powder will work just fine. These are the perfect treat to serve up for brunch with family and friends, and look seriously impressive stacked high with lashings of maple syrup! I use my Nutribullet to whip these together, but if you don’t have one, just use an electric whisk to beat together the ingredients until they are really well combined. The oats will not be quite broken down, but the result will still taste delicious! 1. Place all ingredients in your Nutribullet/electric mixer and blend together until completely combined. 2. If you do not have an electric mixer/Nutribullet, just make sure you mash up the banana really well to avoid too many lumps in your pancakes! 4. Pour approx. 2 tbsp of batter into the pan (to make nice small pancakes). 5. Allow to cook until small bubbles appear in the batter then flip over (I use a spatula!) to cook the other side. 6. Place cooked pancakes in an oven proof dish in the oven at a low heat (approx. 100C) to keep warm, while cooking up the batch. 7. This mixture makes about 16 small pancakes, so you can serve in a lovely pancake stack and then everyone can help themselves! 8. Serve with layers of chopped hazelnuts and bananas in between each pancake and a pour over a generous helping of maple syrup! In 2013 Catherine Buggy set up Boutique Bakery in a small cottage in Donnybrook, Dublin 4. With a passion for baking, Catherine began creating a range of gourmet cake mix ranges alongside Catherine’s blog. 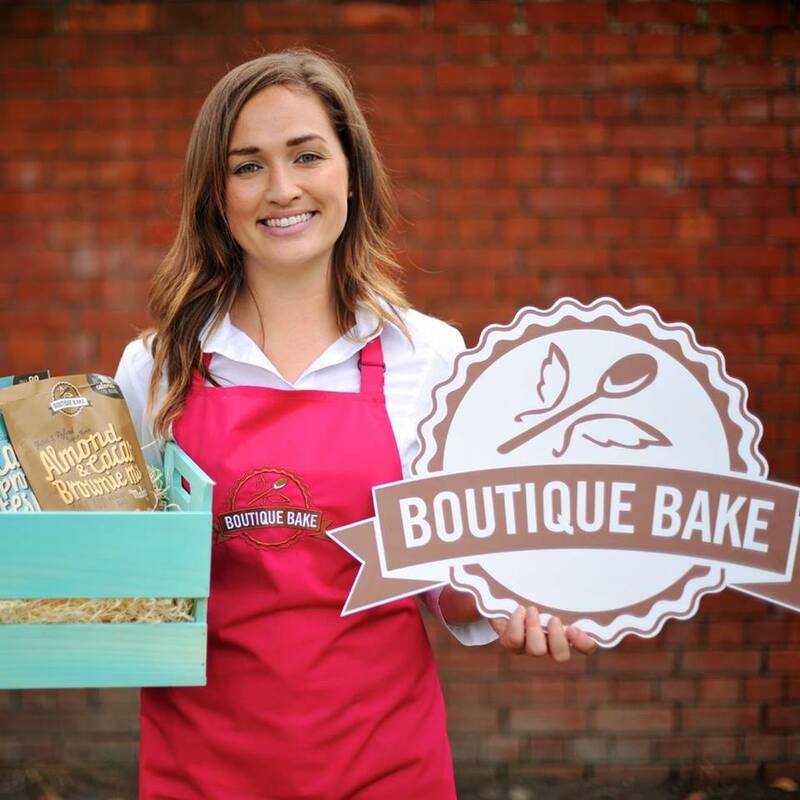 Since 2013 The Boutique Bake range has expanded to include gluten and sugar free mixes, all of which are available in selected supermarkets and artisan stores across Ireland.